Have you looked up a service or business on Google lately and found that the first half of the search results looked like this? 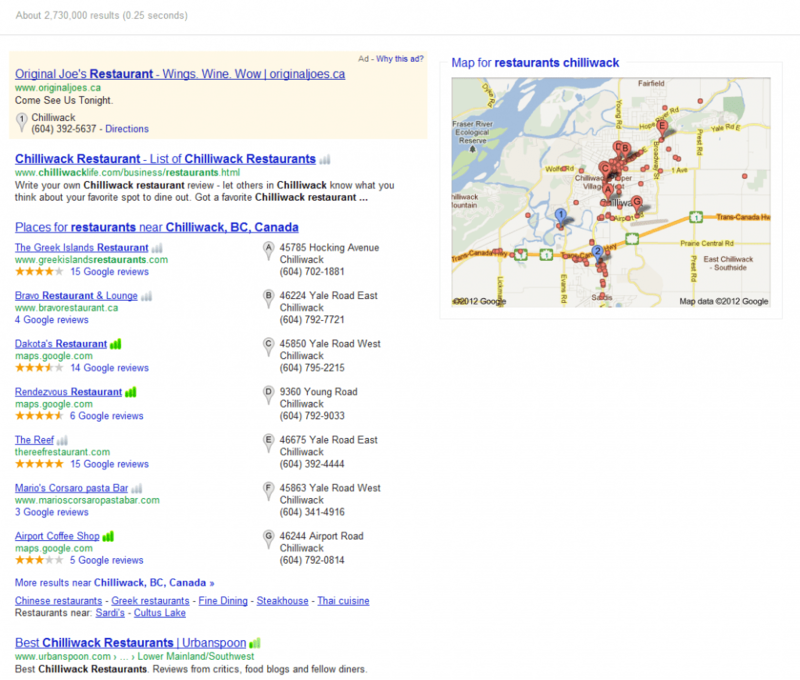 These local businesses show up at the top of a Google search page because they’ve registered their business on Google Places. You can do this too. 1. 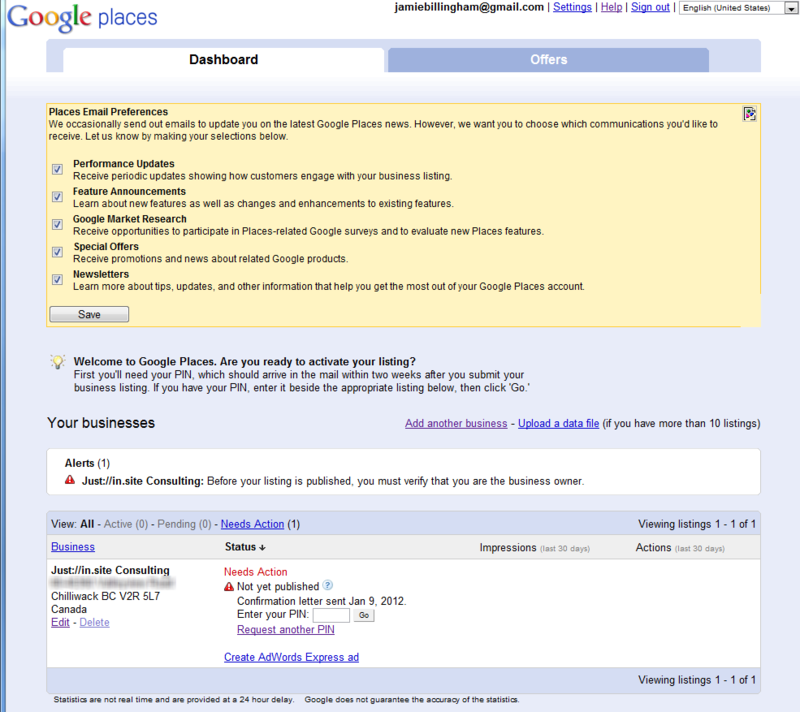 Go to – http://www.google.com/places/ to create/claim your Places Listing. Make sure you’re signed in to your Google or Gmail account when you do this. 2. Complete the online form – The form is pretty straight forward but there is information you’ll want on hand. 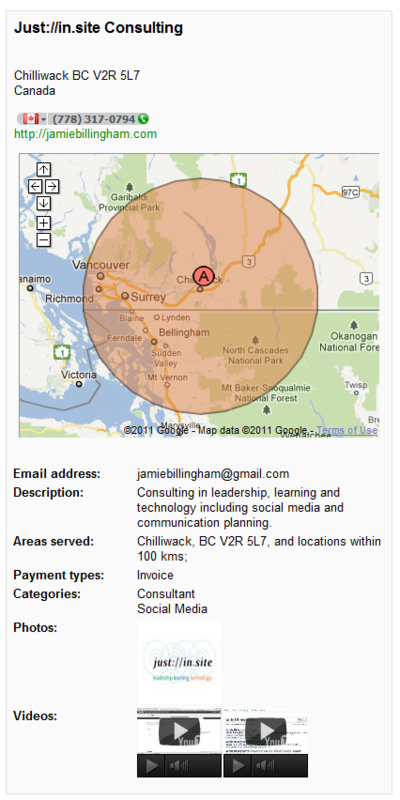 And it is a bit trickier if you work from a home office and don’t want that address listed. The guide below shows that process. I work out of my home and don’t want my address to display but it still needs to be entered into the basic information. 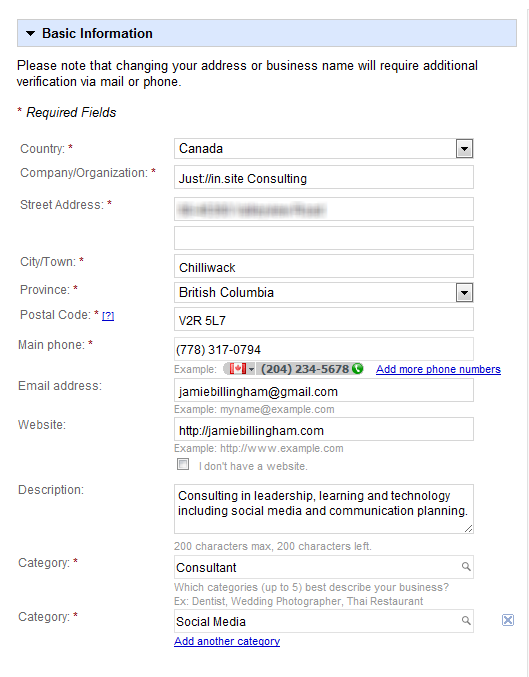 Google will verify your information, in Canada, by snail mailing you a verification key. In the Basic Information section make sure you accurately describe your business or services you provide and add the categories you want to be listed in. This is the part you need to pay attention to if you have a home office or if you provide services to a geographic area rather than relying on customers coming to you. If this full box doesn't automatically display click the small arrow in the top left corner. The last few fields are for photo’s like your logo or pictures of your store, videos and lastly space for additional details. When you’re done click “submit” and you should see your listing information. Mine looks like this. 3. Wait for you PIN and when you get it enter it to Publish and activate your Place Listing. – You should also see a page that talks about mail verification. To be honest I’m having some challenges getting my PIN so have recently asked Google to resend.. So my page will look a bit different from what you will see after you’ve been verified. 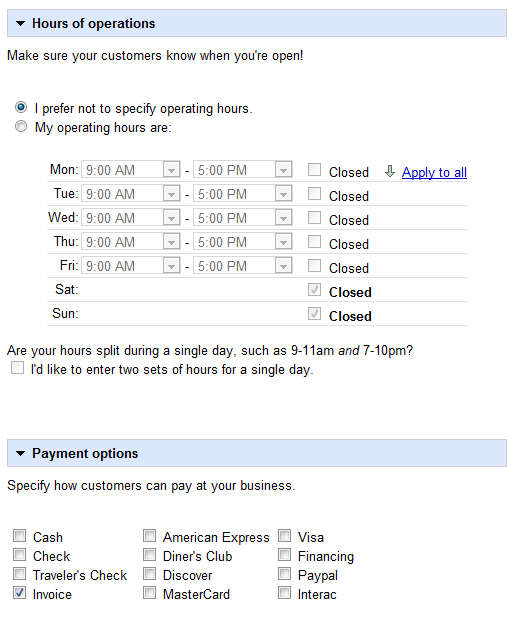 I can show you what your Google places Dashboard will look like while you wait for your PIN. 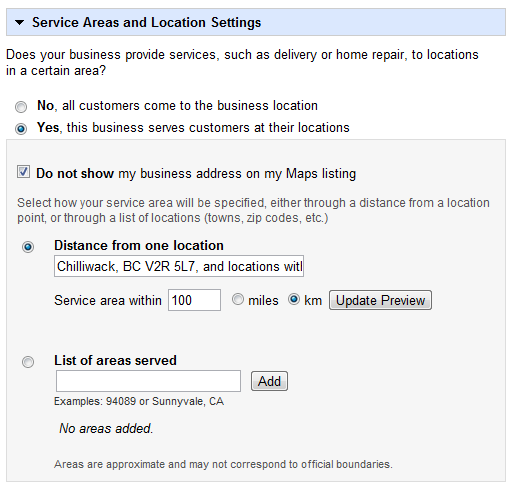 You can access this Dashboard at any time after you have submitted you Google Places information simply by revisiting http://www.google.com/places/ and selecting Get Started. 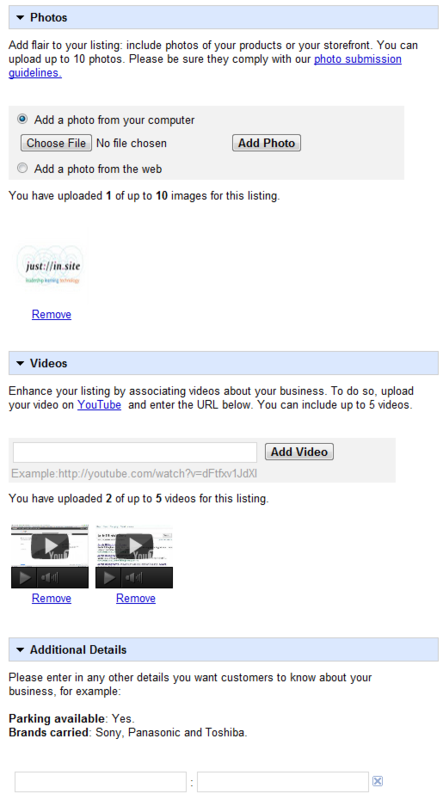 Google is smart and as long as you are signed into your Google account or Gmail your Dashboard will open automatically. After you get your PIN and Activate your place listing you can quickly check on listing stats from here. 4. Get Creative – Hope this help take some of the mystery out of this process. It’s really pretty easy to do. The more difficult part is keeping it up to date. You can edit the photo’s and videos which means there is tremendous opportunity to engage potential customers with fresh content. For some businesses this could mean uploading new photos or videos of daily, weekly or seasonal specials, interviews with new staff or other creative and innovative content. How cool would it be to have a short video of the employee of the month or a video of a chef in action or video testimonials from real customers on a Google Places page! Google has some great videos on their Google Places Video Channel that cover some of the reasons for having a Google Places listing.